You have successfully created and set up your account, and want to double-check your settings? Here is a checklist you can follow to ensure you are on the right track. Remember, this is just advice! We cannot and will not guarantee results with these settings. These settings are merely an easy way to get started. For the optimal settings, you have to do your own research. Are these the right funds on your account? Click the “Edit” button and type in your start balance, so you know exactly how much profit/loss you’ve made. 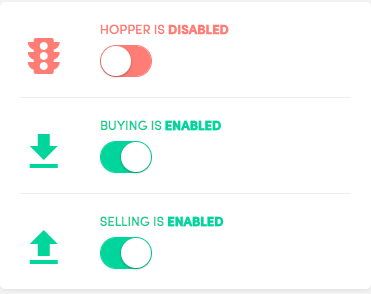 Is the "Hopper", "Buying", and "Selling" enabled? Are there any positions/assets you want to have synchronized? If yes, click "Synchronize". Are there any errors showing in your output? These errors often reflect problems with your configuration. However, the majority of the errors are harmless! If an error continues to interfere with your trades, open a ticket with our support desk. This needs to be enabled in order for the hopper to start making trades rather than just "testing" them. 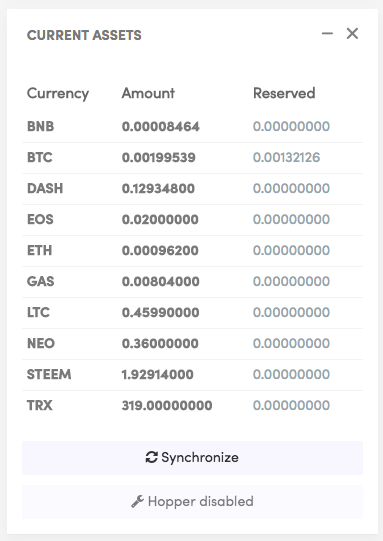 Double-check if you have selected the exchange you are using. Have you filled in the right API keys? Remember that you have to fill in two API keys when using Kraken and you have to fill in a nonce window of 1000000. Make sure that you do not give us the permission to withdraw your funds. This is an extra safety precaution. 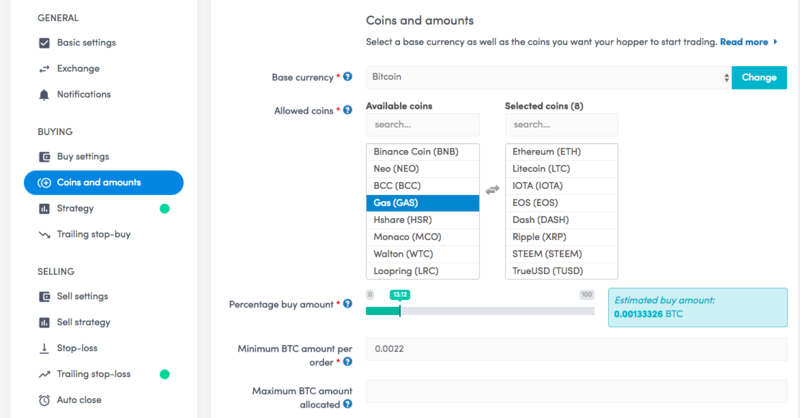 Select the currency you want as a base currency. When US Dollar is selected, you need dollars on your exchange account. Your Hopper will trade dollars for other currencies and will try to make a profit in US Dollars. For all beginners, we advise to start out with selecting a fiat currency like US Dollar, Euro or the crypto variant USDT. It is generally easier to turn a profit with a stable currency compared to a volatile one since you are trading against your base currency. Which coins do you have selected? Please invest in coins you have faith in based on your fundament analysis. Do not select coins randomly hoping the Hopper will pick the right coins for you. If you do this, you’re exposing yourself to a lot of risks. Select a strategy. By default, we advise “Multiple TA”. Users with a firm understanding of these technical indicators tend to more successful traders. However, we'll leave the advanced settings for now. You can find more on the advanced settings under ''Configuration'' in the documentation. Select how much profit you want to make per position. A safe choice is between 1-3%. Your exchange’s transaction costs are not taken into account and are usually around 0.5% per trade. These fees often change, so you should check with your exchange if you want to know the exact fee %. This setting allows you to place a buy order by a percentage lower than the current order book. While it can get you to buy coins cheaper, it might also lead to unfilled orders! This setting allows you to place a sell order by a percentage higher than the current order book. While it may allow for higher profits, it can lead to unfilled orders! The "Stop-loss" option is disabled by default. You might only feel comfortable using this option if you have some trading experience, as the bot may sell positions at a loss. The setting is disabled by default. This will be most interesting to you, if you have a low “percentage profit”. This allows the hopper to only enter trades that have a positive 24 hour change. It automatically closes a position after a certain time has passed, which can range from 1 minute to 6 months. By default set to 5 minutes. This amount depends on how many coins you’ve selected. We advise an equal amount per coin in your portfolio. For example, if you have 4 coins selected you could set this percentage to 25%. What percentage of your assets do you want your Hopper to use per position? This depends on your funds. You have to decide how large or small you want your positions to be. But remember, that you still have to pay the exchange fee. (depending on the exchange, usually around 0.5% or a minimum 0.50 cents). 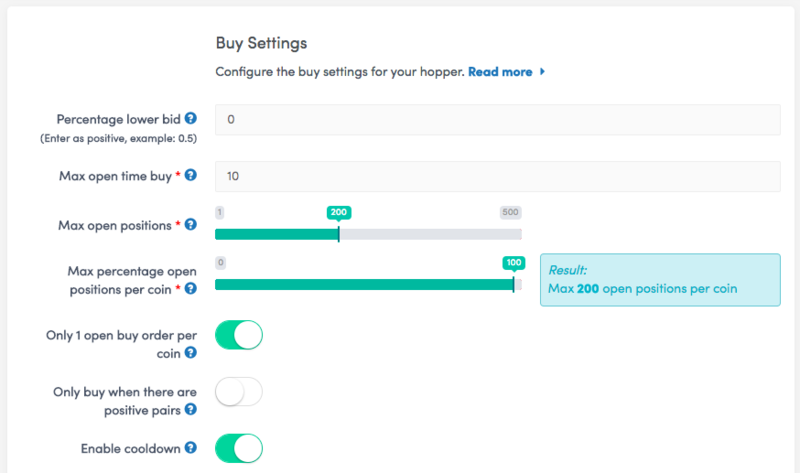 Type in the minimum amount of funds your Hopper will use per position. When your order amounts are too small, it’s harder to make a profit as you still have to cover the transaction costs. If you want your Hopper to run as efficient as possible, we advise you to set up "config pools" for your coins and backtest each of them. Remember, that your Hopper is your tool. We know that the better our users know and use this tool, the better their results become. So, keep informing yourself and start watching and reading all our videos, tutorials and blog posts.